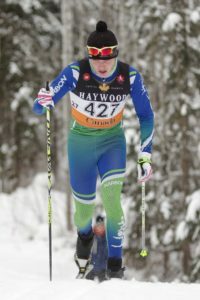 The objective of the Senior Ski Team is to promote excellence in cross-country skiing and biathlon. This team is for athletes who love to ski and want to challenge themselves to find their personal best. While this group will meet for team practices, the individual needs to be committed to train independently and as part of the group. While individual team members are expected to be supportive of each other at all times, and help work together to develop a cohesive team, an individual’s personal goals are paramount to their personal program. Participation in Summer Dryland Training is encouraged. All athletes travelling to out of town races are responsible for their own expenses related to gas, food and accommodations. These athletes also share the gas and accommodation expenses of the coach, lead wax technician and designated chaperone(s). Whenever possible the team travels and lodges together to reduce expenses. Athletes travelling to these races can choose to travel and lodge with their parents but will still be expected to pay a portion of the accommodation and gas expenses of the coach and lead wax technician.